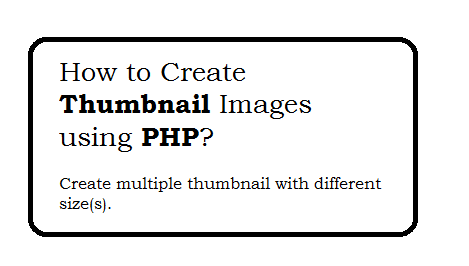 This tutorial will describe how to create thumbnail images on the fly using PHP while uploading a image. With uploaded of single image you can create different thumbnail with different size of same Image. Here you will Learn how to process a images and create their thumbnails. This function is able to create multiple thumbnail with different sizes of uploaded images. How to create thumbnail of 50pxX50px image? How to create thumbnail of 100pxX100px image?